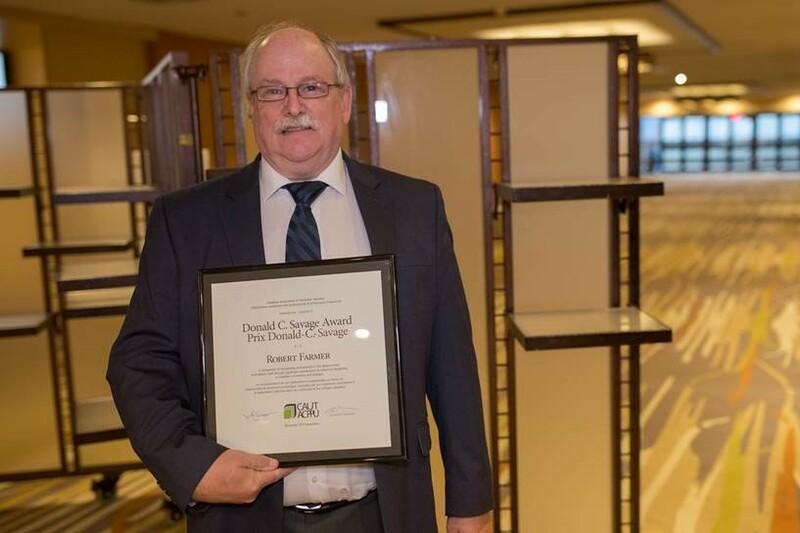 Robert Farmer was presented with the Donald C. Savage Award by the Canadian Association of University Teachers (CAUT) in November, 2017. 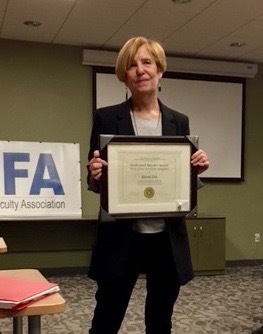 This award recognizes distinguished achievements ­“supporting the cause of collective bargaining in the post-secondary sector” and contributions that have had widespread ramifications for collective bargaining. The Canadian Association of University Teachers (CAUT) presents this award annually, only if there are suitable candidates. This year CAUT selected two recipients: Robert Farmer (Mount Saint Vincent University) and Jon Church (Memorial University of Newfoundland). Robert has over 30 years of experience within educational institutions, initially as an administrator and then as an academic. He currently serves as MSVUFA President, having also served as Vice President, Treasurer, and Member-at-Large. Since 2007, he has had a leadership role in collective bargaining, acting as chief negotiator in 2012 and 2015. As a result, he has established a reputation for his integrity as well as for being fair, responsible, and innovative. Robert has been a member of CAUT’s Collective Bargaining and Economic Benefits Committee since 2013, and, at present, he serves as Treasurer of the Executive of the National Union of the Canadian Association of University Teachers (NUCAUT) and as an active member of the Association of Nova Scotia University Teachers (ANSUT). In 2016, Ilya Blum, Susan Drain, Michelle Forrest, Michael MacMillan, Linda Mann and Rhoda Zuk received the CAUT Dedicated Service Award. 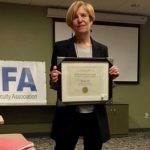 In 2015, Meg Raven received the CAUT Dedicated Service Award. In 2010, Chris Ferns received the Donald C. Savage Award. In 1993, Chris acted as chief negotiator for the MSVUFA and served in this capacity for five rounds of bargaining and two consecutive terms as MSVUFA President. This award acknowledged his role in advocating and building awareness on academics’ economic and equality issues having a broad impact. In 2006, Patricia Baker was the recipient of the CAUT Sarah Shorten Award. Past recipients of the CAUT Dedicated Service Award include, Barbara Casey, Ken Dewar, Chris Ferns, Peter Glenister, David Monaghan and Denise Nevo.